The debates on food security in developed countries have raised questions regarding the capacity of periurban farming systems to provide food for urban dwellers. Attention thus needs to be paid to what kind of food production is performed nearby cities. This study aims at developing a methodology to characterize the food production provided by periurban farming systems in terms of quality, quantity and crop production intensity. The case study is the Pisa’s urban area (Tuscany, Italy), which is illustrative of coastal Northern Mediterranean farming systems. The methodology was based on the construction of farm typologies considering 51 on-farm surveys using multivariate statistics (principal component analysis and cluster analysis). Farms were classified into six types, considering seven on-farm indicators. Results showed that the amount of production sold in the local food system is negatively correlated to the farm’s size and the amount of on-farm food production, thus indicating for local food policies the need to support the food allocation in local markets through specific agri-urban projects. In terms of food quality, we have shown for the first time that local food labels seem to positively impact urban markets rather than organic labels. Crop production intensity indicators have heterogeneous dynamics, which do not seem to depend on the farming system, nor on the farm’s involvement in local food systems. This could be an effect of the proximity to urban areas, a specific character of periurban farming systems, that should be carefully investigated in future research. This is the first time that territorial food production is analyzed combining indicators on food quantity, quality and crop production intensity at the farm level. Our results demonstrate that the highly heterogeneous dynamics of periurban farming systems in developed countries need to be accurately analyzed to develop more efficient food policies with benefits for the urban food security. Periurban agriculture has gained attention in the debate on food security (FAO 2010), considering the increasing part of the worldwide population living in urban areas, which generates a growing and concentrated food demand around cities (FAO 2010; Opitz et al. 2015). The periurban farming system (PFS) has been defined from a geographical perspective as the farming system performed in a defined space close to an urban area (FAO 1999). In Europe, since the mid-1950s, urban areas have expanded more rapidly (78%) than the urban population (only 33%). Eurostat (2015a) reported that 75% of the European population lives in an urban area in 2015. However, there has not been any compensation for the farmland losses caused by urbanization (EEA 2010), thus affecting the way PFS can develop further (Heimlich and Anderson 2001). According to the World Food Summit (1996), “Food security exists when all people, at all times, have physical and economic access to sufficient, safe and nutritious food to meet their dietary needs and food preferences for an active and healthy life.” While in the Global South the issues of food security never went away, in the Global North they have remerged as urban issues (Sonnino 2014; Opitz et al. 2015). In developed countries, the question of feeding people has remained in the background, given the advances in the industrialized agri-food system which has ensured affordable food for all. However, various global events have revealed the vulnerability of such agri-food systems, even in developed countries, such as the cereal price surge in 2007, the unknown effects of climate change and the increasing land use conflicts. According to the figures in Europe, the number of people dependent on emergency food increased by 75% between 2009 and 2012 (International Federation of Red Cross 2013); moreover, the 10% of the population declared to be unable to afford a quality meal (Eurostat 2016). In this context, the sustainability of actual industrialized food systems has emerged as a major issue. Urban food policies emerged as a tool to foster urban food security in developed countries. Started from the USA and Canada, they have now reached the attention also of the European cities (Sonnino 2014). The food policies aim at combining the efficiency in allocating a sufficient quantity of food production with the challenges regarding environmental and social sustainability (Sonnino 2014). Moreover, the concept of food security has been declined in the notion of community food security to embrace new political vision on food justice and consumers’ empowerment (Anderson and Cook 1999; Morgan 2015). In Italy, Brunori et al. (2013) observed that food security cannot be separated from the food quality, i.e. how food is produced and processed, where it comes from and which is its impact on the environment and the society. Alternative food networks, community-supported agriculture and food policy councils may be applications of such principles, where consumers are led to be proactive in more sustainable consumption patterns, and producers have a more prominent role in driving the food supply (Morgan 2015). According to literature, the food security debate should also be focused in promoting a stronger market power for farmers (Fish et al. 2012). It should not only be concentrated on healthy food but also on guaranteeing good prices and a more ecological production (Fish et al. 2012), while at the same time promote more sustainable food production, leaving aside the “productivist” paradigm (Maye and Kirwan 2013). The role of farmers in strengthening food security is thus a matter of interest and “understanding the current state of local scale agriculture is a first step towards aligning agricultural and nutritional goals” (Morrison et al. 2011 p. 498), (Fig. 1). Following the debate of food security, literature has pointed out three dimensions of the food production that need to be taken into account: the food quantity (Timmons et al. 2008; Morrison et al. 2011; Filippini et al. 2014; Sonnino 2014; Opitz et al. 2015) and the food quality (Morrison et al. 2011; Sonnino 2014; Opitz et al. 2015) along with the ecosystem services provided by the intensity of food production (FAO 2010; Schneider et al. 2011; Fish et al. 2012; Wortman and Lovell 2013; Diaz-Ambrona and Maletta 2014). The assessment of the quantity of food provided by PFS covers both the amount and the range of products produced by periurban farms (Opitz et al. 2015; Monaco et al. 2017). The literature on food capacity considers the inclusion of PFS as a strategy to defend a more reliant local food system (LFS) from the inefficiencies of the global industrial food system (Morrison et al. 2011) and the global food price volatility (FAO 2010), thus supporting the benefits linked to reducing “food miles” (Coley et al. 2011). Agronomical research on PFS’ food production capacity considers not only the amount of hectares but also the crop yield and its stability, considering different farming practices, climate change and soil conditions (Morrison et al. 2011). Difficulties in food production assessment are usually related to the lack of datasets on the production and the consumption of food at local and regional levels (Timmons et al. 2008) as well as the lack of farm-based studies (Mok et al. 2013; Filippini et al. 2014). There are also concerns regarding the capacity of PFS to produce food for urban dwellers, which can be affected by urbanization. This occurs firstly through a reduction in and a fragmentation of the agricultural land (Allen 2003), secondly with a decrease in the suitable areas for agriculture (Salvati et al. 2012) and the conflicts over farmland use (Darly and Torre 2013) and finally with a difficult access to agricultural land to farmers by the rise in prices for the rent or the purchase of land for urban purposes (Morrison et al. 2011). In addition, there is still a gap between the food produced in the periurban fringe and the food actually delivered to local markets, despite geographical proximity (Filippini et al. 2014). Thus, in order to forecast the future food provision potential (Timmons et al. 2008), it is essential to quantify and understand the food production that is actually possible to sell locally (Filippini et al. 2016). The food quality of PFS is usually associated with the benefits of proximity which may facilitate the procurement of fresh, tasty, healthy food and at a cheaper price due to the shorter distance (Caputo 2012). Today, such quality criteria are gaining increasing attention in consumer preferences, to the extent that consumers are more likely to choose local than organic food (Adams and Salois 2010). However, several authors have criticized the perceived quality of food based on just a proximity relationship (e.g. Mok et al. 2013), because it does not take into account the specific agricultural conditions of production: pollution from industrialized areas, urban smog and land and water degradation may affect the quality of food (Heimlich and Anderson 2001; Wortman and Lovell 2013). Thus, in the food quality debate, Opitz et al. (2015) make a distinction between non-certified and certified production. In non-certified production, quality is linked to the basic food safety requirements of the global trade, which however have shown several weaknesses (Morrison et al. 2011). In certified production, the food quality is defined by specifications, measurable and standardized characteristics and regular controls, which redefine the link between food and bioprocesses. Organic label, PDO and PGI certifications are common certifications in Europe. Accordingly, the total organic area has been increasing and among European countries, Italy represents 13% of the total European organic area, only second to Spain (17%), followed by France (11%) and Germany (10%) (Eurostat 2015b). However, few studies have been conducted on the importance of such productions for European PFSs, to the extent that it seems that there is no evidence that in periurban areas, farmers are more encouraged than elsewhere to adopt organic production, especially for urban food security reasons (Zasada 2011). Finally, a new design of food production is also required, to make PFSs more able to contribute to urban food security. The challenge is to increase the land use intensity, avoiding land degradation (Schneider et al. 2011) and overcoming land scarcity, for example by acting in the “space-intensive production system” (Wortman and Lovell 2013). Intensity is here defined as the ratio of inputs and outputs within the farming system (Ruiz-Martinez et al. 2015). The literature has already shown that in Europe, periurban farmers tend to have more intense cropping systems (van der Sluis et al. 2015); however, few studies focus specifically on this topic at the local scale (Ruiz-Martinez et al. 2015). A frequent bottleneck in such studies is again related to the availability of data on farm management at landscape or local levels (Herzog et al. 2006). Although studies have found regional trends in the adaptation of farming systems to urban pressure, they have also highlighted that in every regional trend, there is a high variability in the behaviour of farms. Farmers’ strategies may differ depending on the specific internal and external conditions of the farm, as well as the way farmers react to such conditions (Clark et al. 2007; Zasada et al. 2013). According to the literature, urbanization leads to a diversification of farming activities which is stronger than in other areas, since it depends on the different urban demands and urban influence on agriculture activities (Zasada 2011). Analyses based on farm typologies can therefore highlight the heterogeneity of PFS at the local level, and are thus required (Andersen et al. 2007), in order to understand the characteristics of the PFS in itself, to identify the production possibilities and to support recommendations and specific actions for PFS development (Landais 1998; Köbrich et al. 2003; Dossa et al. 2011). Several studies on farm typologies have been carried out, aimed at understanding the contribution of agriculture to urban food security. Most of these studies have focused on developing countries, in the context of rapid population growth and social instability (i.e. Köbrich et al. 2003; Dossa et al. 2011). In Europe, studies at the local level on periurban farm types are often based on mixed methods (i.e. Soulard and Thareau 2009), while more quantitative methods enable researchers to compare different case studies (Dossa et al. 2011). Quantitative methods have been used at the macro-regional level, for example to create European farm types, in order to assess product specialization among urban, periurban and rural areas (Zasada et al. 2013). For example, agriculture food production in metropolitan areas in Europe seems to be more specialized in horticultural intense crops and, to some extent, in grassland and livestock production, than in periurban areas with a lower population density (Zasada et al. 2013). In studies done at local level in Europe, farm typologies have been used to assess farm management in marginal rural areas (Gaspar et al. 2008), but not in periurban areas. They also usually focus on analyzing different farm types for specific productions, such as livestock (Kostov and McErlean 2006) or cereal crops (Capillon and Geneviève 1996), but they do not usually combine different farming systems in a same area. In addition, considering the complexity of characterizing food security (Fish et al. 2012; Sonnino 2014), the farm typology should involve different dimensions of the food production. Considering a specific area, Gaspar et al. (2008) assessed a combination of technical, economic and productive aspects, creating types of livestock farms with varying levels of intensive production and profitable production, and bigger or smaller farms in terms of usable agricultural area (UAA). Dossa et al. (2011) and Huynh et al. (2014) combine social and technical indicators to describe farmers’ activities. To our knowledge, there are no farm typologies based on indicators regarding together food quantity, quality, and the intensity of crop production. This is an interesting topic considering the importance of the food security debate in Europe and the increasing focus on urban and periurban agriculture (Opitz et al. 2015). The purpose of this study is to develop a methodology for the characterization of the food production of PFS using statistical-based farm typologies (Landais 1998). Food production is characterized using the indicators of quantity, quality and crop production intensity of periurban farms. We believe that integration of these indicators provides a more complex understanding of the PFSs and thus of their effective role in fulfiling the urban food demand. The case study is the PFS of the urban region of Pisa in Tuscany (Italy). It consists of six municipalities joined under an inter-municipal area, having a total surface of 500 km2 and a population density of almost 400 inhabitants per km2, representing the second largest urban area in Tuscany. This area follows the European urban demographic trend for the last decade: in the last national census of 2010 while the number of citizens has decreased in the city (− 4%), the nearby urban centers have increased their population on average by 8% (Comune di Pisa 2015)). The urban region of Pisa is composed by an alluvial reclaimed plain, surrounded by the Tyrrhenian Sea at the West, the Massaciuccoli lake at the North and the two hilly systems at the East/North East and South called Monte Pisano (max 900 m above sea level) and Colline Livornesi (max 460 m above sea level). All the coastal area is under a natural regional park, and other natural protected areas of local importance are in the hills. The area is characterized by a high heterogeneity of soils deriving land reclamation, shifting from peaty soils nearby the Massaciuccoli lake to sandy soils in the inland plain. These soils are suitable for cultivation without major limitations in the crop choice except for the coarse soils located in the hilly areas and for reclaimed clay loams mainly located in the Pisa municipality area. The area is located in a typical Mediterranean climate and presents a high rainfall heterogeneity shifting from the annual 800 mm in the coastal areas to more than 1000 mm in the hills. The area is representative of the main trends in periurban agriculture in the coastal plain of European Mediterranean areas, presenting a mix of arable, permanent and mixed small-scale farming systems which have rapidly evolved since the 80s (Marraccini et al. 2012). Usable agricultural area represents 49% of the total surface, and the average farm size is 14 ha according to the 2010 national agricultural census. In the coastal plain, farms are oriented to winter cereals, industrial crops, livestock and vegetables, while in the hills, there are exclusively olive groves on stone wall terraces. Despite the importance that policies accord to periurban agricultural land, the last agricultural census highlighted a steady decrease in the used agricultural area (16% less) and the number of farms (71% less) in the urban region since the 1980s (Marraccini et al. 2012). This decrease affects more small and non-diversified farms, whereas larger and diversified farms are more adapted to the urban context (Soulard et al. 2018). There is also interest in the area at the institutional and societal levels to promote local agriculture as shown by the experiences of several agro-urban projects carried out in the area (Marraccini et al. 2013a). In the sampling process, a stratified sampling has been used. The farm population from the Land Parcel Identification System (LPIS) database was divided in homogeneous subgroups, representing the local farming system as described by Ruiz-Martinez et al. (2016). Farms were selected considering three criteria: the main farming system, the farm size, and the geographic distance of the farmstead from the urban center. Thus, they have been contacted and selected on the basis of their acceptance to participate in the interviews. The sample reflects the diversification of the existing territorial farming system of the area: 11% of vegetable farms with an average size of 11 ha; 17% of olive grove farms with an average size of 6 ha; 21% of fodder farms with an average size of 180 ha; 25% are cereal farms oriented to winter cereals with an average size of 137 ha; and 23% of farms have industrial crops (e.g. soybean, sunflower, tomatoes) as the principal farming system and an average size of 245 ha. Among the fodder crop farms, livestock producers were detected representing the 80% of the total livestock unit (LSU) of the area. All the classes of farming systems were an overestimate in our sample, except for the industrial crops’ farms, which represent 32% of the total farms of the inter-municipality (Comune di Pisa 2015). In fact, industrial crop farms in the area are often indirectly managed (e.g. contract works or part-time) and it is more difficult to involve these farmers in research studies. We conducted semi-structured interviews with 51 farmers, performed between 2012 and 2013 (Filippini et al. 2014). The interviews’ purposes were to understand the structure of the farms, the characteristics of the farmer, his/her relationships with the urban area and the countryside, the crop commercialization and the crop management. The sample dimension is comparable with that of the other local case study analysis (Gaspar et al. 2008; Köbrich et al. 2003) and it is thus appropriate for the purposes of the study, and the adoption of semi-structured interviews guaranteed a depth analysis of the farm functioning and of the farmer’s choices. A total of 26 farm gate indicators were identified and calculated in a preliminary phase to estimate the food quality, food quantity and crop production intensity of the PFS (Table 1). The indicators were calculated from the data collected during the on-farm interviews. By “quality”, here, we refer to the quality of the farming system and not the chemical properties of the food or the nutritional characteristics. Considering the debate on the difficulty in defining the quality of a product, here, quality indicators refer mainly to a certified quality (organic and denomination of origin labels), as well as the controls on the production system and the degree of on-farm self-sufficiency. Quantity indicators refer to the estimate of the amount of food produce depending on several parameters: hectares, yield, the percentage of the five classes of main productions, the percentage of hectares with locally allocated products and the gross income from each production. Finally, “intensity” refers to the farming practices and the crop management, e.g. crop sequences, input management and livestock density. The statistical analysis involved four steps to obtain a typology of the on-farm food production. First, an analysis of the coefficient of variation (st. dev./average) was carried out, in order to remove all indicators with a coefficient of variation greater than 0.3, which were the least homogenous indicators. All the indicators identified have a coefficient of variation higher than 0.3, so all the indicators were maintained, in this first step. A Pearson correlation analysis was then performed to remove all highly correlated indicators (r > 0.7). Multiple correlated indicators were the candidates for deleting. Among them are several food quantities, gross income and crop production indicators. The threshold used for the correlation and variation coefficients were chosen considering the existing literature (e.g. Köbrich et al. 2003; Marraccini et al. 2013b). A principal component analysis (PCA) was performed with the CANOCO software (Lepš and Šmilauer 2003), in order to select the indicators which might better explain the total variation in the sample. We repeated iteratively the PCA six times until the value of the explained data variability stopped to increase. Each time, the components with values greater than 0.1 were considered for the selection of indicators, following Kaiser’s rule (Köbrich et al. 2003). The indicators most correlated with each significant component were selected. In the first step of PCA, two farms were recognized as outliers, with 49 farms remaining. These two farms corresponded to a university experimental farm and a very large livestock farm with respect to the rest of the sample. Thus, we performed five other iterations of the PCA, reducing the indicators from 49 to 7 and increasing the explained data variability from 23 to 79%. The final list of indicators selected were PUAAFod (rate of UAA with fodder), PLocal (rate of production sold in local food system), OrgProd (presence of organic certifications), PUAAOliv (rate of UAA with olive production), Pfood (rate of crops with direct food destination), PUUAIndu (rate of UAA with industrial crops), and HA (on-farm total agricultural area in hectares). With these seven indicators, a hierarchical cluster analysis (HCA) was performed. In order to have a number of clusters that would maximize the cohesion inside the groups and the distance between the groups, we hence used Ward’s method and the Euclidean distance with XLStat software. Once obtained the dendrogram, it was also divided into six groups, to have a meaningful interpretation of the clusters (Köbrich et al. 2003). Six clusters ensured a maximization of the inter-cluster variance and a stability of the smaller cluster size. Most of the variables were excluded from the statistical procedure in the correlation analysis. This was the case for all the quantitative indicators related to the gross income of produce, and also to indicators related to the amount of produce, which in the analysis were correlated to other amounts of produces (e.g. the value of a quantity of watermelons was correlated with a quantity of strawberries). In the PCA, all the indicators related to the specific amount of production were excluded from the procedure since they were correlated with the quantitative indicators related to the percentage of UAA devoted to industrial crops, vegetables, olive production, cereals, and legumes. Of these, only two indicators, PUUAIndu and PUUAOliv, remained, since for example PUUACer appeared to be highly correlated with PUUAIndu. The other quantitative indicators maintained were related to the amount of hectares (HA) and percentage of crops for human food consumption (PFood). Among the quality variables, organic labels (OrgProd) was the only indicator finally selected. While most of the quality indicators were eliminated during the PCA steps, the other labels (LocLab) were excluded at the very end to better explain the variance of the sample. Considering the intensity indicators of the land use crops, most were excluded at the very end of the PCA procedure. The only one finally selected was PUAAFod, the percentage of UAA devoted to fodder. As can be seen in Fig. 2, PUUAFod and Pfood are at the opposite ends of the horizontal axis: farms with a high percentage of fodder are in opposition with farms with less fodder but more food-oriented products. This is due to the fact that the fodder productions are mainly for livestock feeding. In other words, livestock farms are at the opposite end of this axis from other farms. The vertical axis expresses a negative correlation of indicators between the size of the farm (HA) and the percentage of industrial crops (PUUAIndu) with organic productions (OrgProd) and the percentage of local markets (PLocal). This seems to suggest that bigger farms are less involved in local markets and in organic productions. At the same time, the percentage of UAA with olive productions is negatively correlated with hectares and positively correlated with organic productions, suggesting that this production is concentrated in small farms with organic productions. In Fig. 2, it can be seen that the farms representative of the olive groves are all grouped around the same indicator, PUUAOliv. On the other hand, farms representative of vegetables, industrial crops, and cereals have a more dispersed dynamic in the graph. Also, PUUAFodd groups the farms with the fodder production as the main farming system; however, this indicator also seems to attract farms with other farming systems, especially cereals and industrial crops which in fact usually combine cereals and industrial crops with fodder in their crop rotations. This suggests the farms tend to opt for intensity in terms of production, and this is not necessarily related to having livestock production. The results of HCA are six types of periurban farms in terms of food quality, quantity, and crop production intensity. Only type 1 is composed of one farming system alone, olive crop-based, while all the other groups are more heterogeneous. Also, vegetable productions are mostly concentrated in one group (type 2), but other farming systems are part of type 2. Of the others, type 3 has the highest amount of fodder, but it also appears in type 4 and especially in type 5, suggesting the presence of different types of livestock farms. This result hints that most of the principal farming systems do not define the group, apart from olive production which has a particular production system (monoculture in hilly areas) (Table 2). The first type groups all the olive farms. Except for one farm that also produces kiwis and vineyards, these farms produce only olives (Table 2), which means that in our sample, this production is not associated with other productions and the farms are highly specialized. The farms are also highly certified: 78% of farms have organic labels (Table 3) and 78% have origin labels, mainly protected geographical indication (PGI), and these values are the highest among the six types. On average, 50% of the farm production is allocated to local markets. It is one of the highest values in the sample, but it also indicates that 50% of the production is not for local consumption and leaves the area through tourism or an international niche market, because of the high quality and labelling (organic, PGI). The crop’s intensity indicator values indicate on the one hand a low intensity production, for example in terms of pesticides (NTreat) and organic manure use (PUUAMan), but for other indicators, it seems to be more intensive, for example regarding the rotation (NRot). This is due to the fact that farms are only highly specialized in olive production. This dependency on one product’s market may also explain why these farms have hybrid food chains between local and non-local markets, as suggested by the fact that 50% of production on average is for local markets (Table 3). The second type is characterized by all the vegetable farms and other small industrial crop and cereal farms. As expected, this type has one of the highest values for food production (PFood) (86%), which means that the crops produced are almost all for human consumption; moreover, it has one of the lowest rates of fodder crops and no livestock farms. Despite the importance of food production and the diversification of products represented by this type, the farms are poorly connected to local markets (26%) and have virtually no organic productions (Table 3). This seems to show that in this geographical area, vegetable production for LFS is not considered much attractive by farmers; in fact, in this area, vegetable crops are traditionally targeted at conventional food chains at regional and national levels. The farms in this type have a relatively small UAA in common (Table 3). The data in Table 2 also suggest a high intensity of crop production, especially considering the low rate of fodder crops in the farm UAA (PUUAFod) and the high number of phytochemical applications (nphyto). Vegetable farms are strongly specialized and they do not seem to exploit crop rotation, for example with fodder and other perennial crops, confirming that vegetables have a similar pattern of crop’s intensity as some cereals and industrial crops already shown in the PCA. The third farm type is mainly made up of livestock farms (65%) and other cereal farms. In fact, most of the livestock farms are in this type. This type has the highest average percentage of production in local markets (64%), suggesting a relation in this area between livestock production and sales in local markets. These farms have one of the lowest values of organic production but one of the highest values of the “LocLab” variable: for example, several farms have PGI labels. This suggests that for livestock production, certification of origin is more interesting for farmers than organic labels. The farms in this type seem to be less intensive in terms of crop intensity than for example farms in types 4 and 5 which have livestock productions too, as revealed by the higher level of fodder in rotations (PUUAFod), which also affects the lower value of UAA with short crop rotations (Rot3Y). The fourth type consists of the largest farms (average UAA 453 ha). They have one of the lowest values in terms of production allocated to local markets and one of the highest values in terms of percentage of food production (PFood), suggesting a trade-off between the quantity of production and allocation to local markets. The farms in this type have the highest average value of number of rotations, suggesting they try to adapt the crop system to pedoclimatic constraints. They also have a high percentage of industrial productions (PUUAIndu), which is balanced by fodder productions (PUUAFod) with respect to type 5, which has the highest percentage of industrial crops on UAA (Table 2). Considering the quality indicators, two out of the four farms are organic but they are not connected to their local market, and in the interviews, they claimed that they had some constraints in linking to LFS. The fifth type groups together a specific kind of livestock farms, and it also includes some large cereal farms. Similarly, to the other types of large farms (4, 5, 6), this type is characterized by the lowest percentage of food allocated to local markets (Table 3). The cropping system seems to be less intensive, considering the crop intensity indicators especially compared with type 6, since the higher value of PUUAFod, especially alfalfa, among all the farms of this type. These cereal farms are thus imitating the crop rotation of livestock farms. In this type, livestock farms are the largest in the sample and they have no link with local markets. Compared with the livestock farms of type 3, livestock farms of this type have the lowest values for livestock density (LSU.UAA), probably due to the higher UAA. In addition, the livestock productions of this type are all dairy farms, while in type 3, livestock productions are mainly cattle cows or dairy sheep for cheese production. The farms in these types have no labels nor any other kinds of certifications (Table 3). The sixth type is mainly made-up industrial crop farms with no link to the local market or to organic production and the lowest percentage of UAA with fodder (Table 3). They appear to be more intensive given the high percentage of UAA with short rotations (Rot3Y), the high rate of winter cereals (SSAUwc), and the high number of phytochemical applications. These farms also have the highest value of food productions and one of the lowest percentage of production allocated to local markets (Table 3), confirming a negative correlation between the two indicators of food quantity, since the largest part of food production is devoted to global markets. In particular, it highlights a negative correlation between local markets and industrial and cereal crops. Interestingly, this type has the highest percentage of tomato production, which is in rotation with industrial crops. This is a traditional production in the area, classified as an industrial crop, and is processed at conventional food chains outside the region. This result suggests a trade-off between traditional food production and local food chains, especially for some vegetable productions, cereals and industrial crops. It also confirms a food potential that has not yet been exploited for local consumption. In this study, the food produced by periurban farms was characterized by classifying farms into six types which combine indicators of food quality, quantity and crop production intensity. The three classes of indicators were chosen to provide a more complex understanding of the PFSs and thus their effective role in fulfiling the urban food security (Morrison et al. 2011; Opitz et al. 2015; Sonnino 2014; Wortman and Lovell 2013). Farming systems are the subject of several policies, both integrated (e.g. food policies) and sectoral (e.g. agricultural policies). Since farmers are active stakeholders in food security (Fish et al. 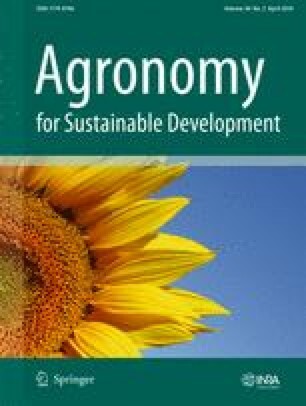 2012), a deeper knowledge of the local farming system is needed (Morrison et al. 2011), especially considering the peculiar conditions of production of PFS (Heimlich and Anderson 2001). The six identified farm types provide confirmation of the territorial heterogeneity of the farms’ activities (Clark et al. 2010) in terms of food production, even in a small area such as in our case study of the urban region of Pisa (Italy). Especially, since this study considers the farms that both participate and not in local food system (LFS), it allows to identify the farming systems that can contribute to the food security through local production. This may sustain the design of policies that support and coordinate the actors involved in the local food production. Several readings can be made from the data collected in our study. Firstly, in most of the cases investigated in this study, the principal farming system does not define the type of group: it is not the farming systems that are crucial but the practices within these systems. Only olive farms are not associated with other farms, and they are highly specialized. Conversely, livestock productions are in three farm types, thus sharing similar patterns with farms that produce cereal and industrial crops, especially in terms of crop production intensity when livestock production is hors sol. Livestock farms differentiate themselves because of the allocation of food to local markets and the presence of certified production. Results show a different dynamic for cattle and dairy farms, since in our case study, cattle farms are more connected to LFS and to origin labels, while dairy farms do not rely on LFS and on origin-certified production but only on the basic safety hygienic controls and nutritional quality (e.g. fat rate). At the same time, in our sample, vegetable farms share with cereal and industrial crop farms a similar pattern of production in terms of food crop production intensity, quality and quantity, especially considering the size, and the lack of certified productions, even for farms participating in LFS. Our analysis of the principal farming system highlights the difficulty that traditional farming systems (in our case, vegetable and cereal farms) have in reaching and relying on alternative markets, such as local markets. In the case of vegetable production, even when farmers participate in LFS, they remain connected to the conventional food chains as wholesalers, as a strategy to exploit different markets and to reduce the perceived risk of the LFS market (Filippini et al. 2016). Conversely, in our case study, livestock production is a niche farming system and is well placed in the local market. This is probably because local breeds tend to be promoted in the area (Filippini et al. 2014). Farms that specialize in olive oil production, which combines local and global food markets, represent a different case. In fact, olive production is also associated with the tourist market which, although being a local economic opportunity for farmers, has no positive impact on the food security of the local urban system. Secondly, about the three classes of indicators, our results suggest a negative correlation between quantity and quality indicators: the larger the farm, the less production is certified. Moreover, there is a negative correlation among quantity indicators, as the amount of hectares of the farms and the percentage of production devolved to LFS. In fact, the larger the farm, the less production is allocated to LFS. This result is interesting since many studies assessing food production capacity have concentrated on the amount of hectares, product and yield (i.e. Timmons et al. 2008; Morrison et al. 2011), while more attention should also be paid on the actual production devoted to LFS (Filippini et al. 2014). Furthermore, farmers with a wider range of products are the less involved in LFS: this may be explained by the fact that many farmers involved in selling local food need to be more specialized in fewer productions, in order to have enough food to sell (Filippini et al. 2016). In our study, the productions less involved in LFS are above all cereals, industrial crops and vegetables. For these types of productions, farmers have several constraints such as the need to rely on processors to sell the product locally or the fact that the marketing is delegated to cooperatives whose aim is to place the produce in the best markets with a lowest possible transaction cost. Maximizing profit concerns quantities sold rather than local food security. Studies on food capacity, urban food security and LFS should also include those local commercial actors, such as cooperatives, processors, and wholesale markets which up to now have been excluded from most of the LFS studies, but which may play an important role in driving food security (Sonnino 2014). The analysis of the dynamics of food quality indicators shows that in our sample, organic production is not particularly frequent apart for specific productions such as olive oil. In this case, organic farming is an opportunity to increase the added value of their product since little diversification of crop production is possible due to the location of olive groves in hilly areas with terraces. On the other hand, among the other farmers, the opinion is that organic labels impose crop intensity which is not always sustainable for farms with small and fragmented farmland. In such cases, conversion to organic production may not be feasible, and it would be interesting to investigate if and how organic labels can take into account the specific conditions of production of PFSs. Nevertheless, we have to point out that there are not so many technical references in organic cultivation, in particular on PFS systems, to sustain and improve the very short growing cycles. One positive example in this case study is a farmer who introduced alfalfa specifically to extend these cycles, but he could afford it because the surface was not a constraint: out of twelve hectares, only five are used. Moreover, organic labels seem to be more frequent in small farms than in the bigger ones. This result is in contrast with the analysis performed at the European level, which have revealed that the average size of organic farms is usually bigger than conventional ones at the national scale (European Commission 2013). However, at the urban region scale, farms are usually smaller than the national average (Zasada 2011). In some case studies, the periurban small-scale farms were more prone to adopt quality and organic labels to meet the urban demand (Opitz et al. 2015). In our case study, among the types of farms that are most connected to LFS, the presence and the function of certifications are variable. For example, the farms most connected to LFS are more connected to labels regarding origin than to organic labels. Farms with organic labels present a high degree of hybridization among local and global food markets (Filippini et al. 2016). In fact, according to the farmers, the presence of labels is seen as a tool to reach a niche market at a global scale, while at a local scale, it does not seem such a decisive factor. Our results lead to the assumption that organic labels do not necessarily help farmers to place products in LFS, while origin labels seem to be more effective. Specific projects on niche production or individual strategies of farmers seem to affect more the allocation of local food production on local markets. This result seems to be in line with studies which oppose organic labels to local labels or simply to commercial relationships based on proximity in attracting urban consumers’ preference (Adams and Salois 2010). Such proximity between farmers and consumers facilitates relationships based on knowledge and makes farmers unique and “trustable”. However, since labels guarantee that external quality controls on the production cycle and on the farm management are carried out, beyond basic hygienic requirements (Opitz et al. 2015), reflections are necessary on the quality of produces produced nearby urban areas, e.g. with respect to pollutants (Heimlich and Anderson 2001; Wortman and Lovell 2013). Several labels are emerging to promote urban regions on-farm produces. For example, in the Milan periurban area, the label “Producer of environmental quality—Milan South Agricultural Park” aims at valorizing the food production of periurban farmers in the local market as well as the ecosystem services provided by the farmers (Gaviglio et al. 2017). Several local initiatives are also highlighted for the Paris metropolitan region by Aubry and Kebir (2013). In our study for example, we found cases of technical assistance provided by associations and farmers’ unions which also support the development of local food chains. The low frequency of labels would seem to indicate that the presence of labels, and especially the organic ones, cannot be considered as the only indicator of the production intensity of crops, thus confirming the choice of the study to develop specific crop intensity indicators. This is especially true for large farms where labels are not frequent but the intensity varies a lot. Likewise, in small farms, organic and other labels are more frequent, but the values of crop intensity indicators vary also considerably, and it is not always possible to define a correlation. We found that less intensive productions are not always correlated with LFS. In our study, the dynamics of the intensity indicators vary considerably even within each farm type. Considering the importance of crop intensity indicators in designing the farm type, further studies should be devoted to studying the intensity of PFSs (Wortman and Lovell 2013), considering the high heterogeneity of practices put in place by periurban farmers. In this study, the characterization of periurban farming system aims to offer a methodology to analyze the possible contribution to urban food security by periurban agriculture. Our analysis has provided relevant information about farming systems that operate in a space, the periurban fringe, which has particular production conditions. The study has quantified and qualified the high degree of heterogeneity of such farming systems, in order to be able to determine what food production is in place in periurban area and how PFS can contribute to local food supply. Moreover, the analysis of the farming systems has combined indicators on food quality, quantity and crop intensity in order to respond to the urban food security debate (Sonnino 2014). From a methodological perspective, the analysis has grouped a heterogeneous set of indicators on food production for the characterization of farming system at territorial level, while usually researchers are concentrated in developing the specific indicators on food quantity, quality and crop’s intensity separately (i.e. van der Sluis et al. 2015). The multivariate analysis has been already applied to characterize a farming system, but here, the aim was to include in the analysis all the productions coming out of the farm’s production system, instead of considering only a unique production (Kostov and McErlean 2006; Capillon and Geneviève 1996), or the productions devolved to specific food chains, as short food supply chains. In this way, we aim to better frame the actual contribution of periurban farms to urban food security. The indicators provided could easily be generalized to other case studies. For example, it might be interesting to analyze the differences of PFSs around medium-sized cities and metropolitan urban centers, as well as to apply the methodology in PFSs with different traditional farming systems. We thus believe that this analysis provides a methodological basis for understanding the contribution of farming systems to achieving urban food security, with benefits for urban food planning. The authors acknowledge ANR funding via the DAUME project no. ANR-2010-STRA-007-01 and the Scuola Superiore Sant’Anna (Pisa, Italy) for the first author PhD grant, as well as all the farmers that took part in the interviews.